We can’t help but notice how many people are starting cool biotech websites. Check out BetterBio, a community-run organization that promises better biotech communication. I love this new spirit of the web where asking for donations is OK and even inspiring. Also check out ConnectingSF, a portal to help those traveling to San Francisco for the big JP Morgan Healthcare conference to connect. The conference is notorious for its large attendance and paucity of online resources, so the site is a welcome addition. Finally, we saw an article in Xconomy about Relay Technology Management, who have a cool app which facilitates partnering with a sophisticated database of drug-related scientific discoveries. It looks like it may be difficult to get a free test drive, but check out this video which shows some of the features. All these sites are harbingers of the next wave of what we’ll be able to do with ‘life science 2.0’ on the web. We think a lot about ways to organize content on the web and social media and our related strategies and tactics, because the format is often non-standard. One tool we’re using is Mind Maps, visualizations in which ideas are organized and expanded upon in a free form fashion. You begin with a core concept and attach ideas–it reminds me of the ‘post-its on the wall’ approaches to software development I’ve seen. A picture is worth a thousand words, so check out this kinase assay social media mind map we created, getting some inspiration from this blog post. As you can see, it’s a great way to organize ideas for areas in which your company might not have a template, including social media. Mind Map aficionados have all sorts of cool ideas for them. You can also embed them in sites, something useful for internal planning. The apps we’ve found most useful are MindMeister (web-based), FreeMind (standalone), and there’s even a droid app which can save files in a compatible format. Your management will likely love these types of diagrams, don’t you think? We’re really excited to attend the ScienceOnline 2011 conference next week in North Carolina. We get interest from both life science marketers and researchers in working together more in the web 2.0 environment. We’re doing two surveys, one for life science marketers and one for researchers, to help facilitate these interactions. We’ll present the results next week and those who participate will get the results sent to them, so please take the survey soon. Note that the conference will be live streamed, and we’ll post instructions here on how to view, and we’ll be tweeting from it as well. 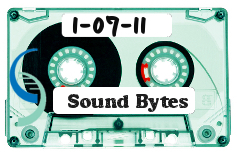 The soundbytes tag on Delicious contains all links mentioned, as well as others we think are useful. Sign up for Comprendia blog email updates to get our mix tapes delivered to your inbox.